Someone needs to buy Christopher Fowler a drink. I’d do it myself, except I’m not in the UK area. Here is a modern writer who understands that, generally speaking, a mystery is only as good as its story. 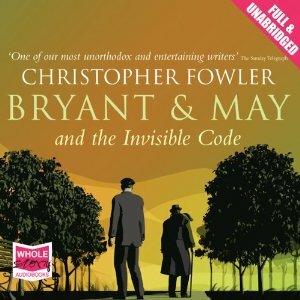 And he comes up with a terrific plot idea in this one: Bryant and May and the Invisible Code. Two children are playing “Witch Hunter” outside a church, and decide that a sad-looking young woman is a witch. “So how are we going to kill her?” one of the kids asks. The woman then enters the church… and then, as the kids watch from the door, the woman drops to the ground, dead! Nobody approached her, and the CCTV cameras clearly show that she died alone. Arthur Bryant gets to hear of this death from his doctor and is intrigued, but the Home Office refuses to hand him the case. Instead, Oscar Kasavian calls Bryant and May to his office. Kasavian, it turns out, needs help. His wife has been going crazy of late—covering the mirrors in the house, talking to strangers on the street, and insisting that a coven of witches is after her life. Kasavian doesn’t understand what is going on, and he’s due to make a major speech in a week’s time. He asks Bryant and May to investigate his wife and try to help her—and if they succeed, Kasavian promises to stop trying to shut down the Peculiar Crimes Unit. This is, of course, a once-in-a-lifetime opportunity to get rid of the PCU’s biggest foe, although Bryant at first complains about having Dracula as a client. His protests are soon silenced, however, because the case turns out to be just the kind that Bryant dreams about. There are connection to witchcraft, the history of Bedlam, and a massive political conspiracy. Readers new to the series are warned that spoilers appear for at least two previous entries in the series: The Victoria Vanishes and (especially) The Memory of Blood. Both are good reads (and I’ve reviewed them in the past), and unresolved plot threads from both stories mix with this one. The result is spectacular. The (first) impossible crime— the opening death in the church— is explained to satisfaction and is perfectly feasible. At first, I thought that the solution came a bit out of left field—but then I re-read the opening chapters and I realized how skilfully Fowler was parading the solution in front of you the entire time. He doesn’t name names or anything of the sort, but he does give you more than enough hints to piece the impossible crime together. Although the method is a bit pedestrian, it does satisfy the reader. A second “impossible” death occurs, but it is a variation on the first death and you know from the start that the same method is used. I really enjoy Fowler’s work for several reasons. The first and foremost is that he tells a good story, and in his most recent PCU books, he concerns himself primarily with the story. While there are some digressions, usually into the arcane history of London, but these are fun. They form part of the books’ charm. I’d far rather have ten pages of Bryant talking about the witches than ten pages of Social Commentary. And in this book, every digression has a point— there are no plot threads left dangling in the wind. Another reason I like Fowler’s PCU books is the characterization. These characters are plenty of fun, especially our dynamic duo, Arthur Bryant and John May. While May is a rational, relatively-sane individual, Arthur Bryant is an eccentric in the glorious tradition of Sir Henry Merrivale. He’s a notorious murderer—no piece of technology is safe in his hand. He constantly destroys his cell phones, manages to break the PCU’s card-key entrance system, and is likely to make even so much as a toaster explode. He solves his cases through a thought process that defies description—which makes it easier for Fowler to withhold those processes from the reader, by the way. John May tries to describe Bryant’s mind as a machine that chew up data and spits it out in a different order. It’s not the world’s worst description. And although Bryant stumbles in the world of today’s technology, May is right behind him to help him up and continue chasing their quarry together. 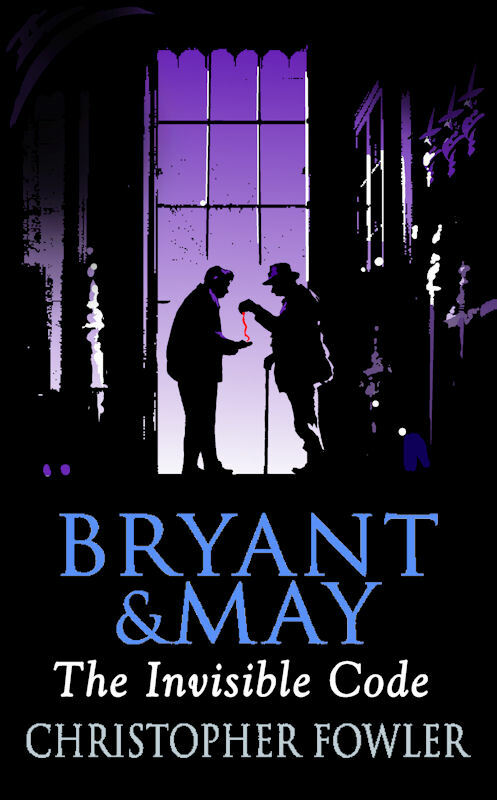 They truly form an excellent duo—although I confess to a personal preference for Bryant. The rest of the PCU is also well-defined, and although I could name names and tell you what I liked about them all in this book, I think this review is getting long enough as is. Discover the PCU for yourself— as someone who has been following the series along with only a few gaps, I noticed in this book just how far everybody has developed from the first entry, Full Dark House. Finally, I love the atmosphere of these novels. This one has a particularly delicious atmosphere: a sense of evil oozes through the pages. The opening chapters are a particularly good example, but there are more passages like that. (Unfortunately, I have to manoeuvre around Spoiler Rapids and really can’t give you more examples.) There are passages of suspense—when the second victim dies, for instance, or during a thrilling chase sequence late in the story. And these are counterbalanced very nicely by some moments of comedy, which can be found in something as simple as a character description. But that’s not all— Fowler does a great job at bringing London to life. I’ve never even been to England, but reading Fowler’s books, I can almost delude myself into imagining London. I suspect this is one of the aspects that keeps bringing me back to this series. Overall, I really enjoyed The Invisible Code. It brings several plot threads to a close, especially one from The Memory of Blood, the previous entry in the series. While you don’t need to read the previous entries in the series to enjoy this one, I would recommend reading The Victoria Vanishes and The Memory of Blood first. This book is a highly enjoyable mystery, plotted fairly. And it comes complete with a sense of the supernatural. Fans are guaranteed to enjoy it, and it might make some new converts as well. Now that I've vowed to go through the series in order it'll be quite some time until I get to read this one. But it looks like it will be worth the wait.